Every year, hundreds of thousands of couples get married in the Philippines including tourists. 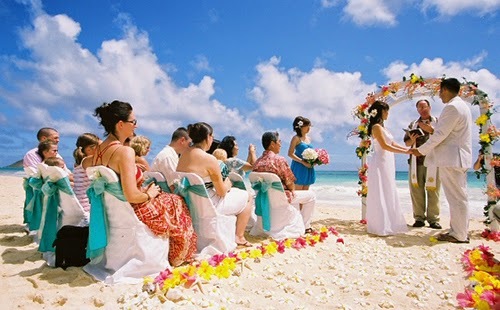 The country is full of tons of venues in various cities, mountainsides of course, beaches. Most would agree that it is very crucial to choose the best venue to celebrate this once-in-a-lifetime union. #1 - Marco Polo Plaza Cebu (Cebu City, Visayas): Several options are offered here including the Cebu grand ballroom, which can seat up to 500 dinner guests and accommodate up to 1,000 for cocktails, the Marco Polo Plaza's Grand Ballroom provides a most impressive venue for functions that truly leave a mark. It has been the venue of choice for international conventions, national conferences as well as prominent social events. #2 - City Garden Suites (Makati City, Metro Manila): If you are looking for a venue that is both stylish and affordable, then City Garden Suites is perfect for you! Located in the Philippines’ capital city of Manila, this outstanding hotel is one of the favorites of many couples. The hotel has 142 guestrooms & suites offering a modern and up to date facilities and five star quality amenities bringing new dimensions in luxury and leisure. #3 - The Waterfront Insular Hotel (Davao City, Mindanao): This hotel is a beachfront gateway to the diverse, colorful and rich cultural heritage of Davao City. As one of the city’s iconic tourist destination, expect superior comfort and excellent customer service. Marvel at the hotel’s sprawling, admirably manicured gardens and landscape while enjoying the scenic view of Davao Gulf right from the verandas of every well-appointed guestrooms and suites. #4 - Taal Vista Hotel (Cavite, Luzon): Located in one of the best tourist destinations of the Philippines for its cooler temperature and breathtaking scenery, Tagaytay is also a desired wedding location of most couples. This hotel overlooks Taal Lake in Batangas and provides one of the iconic views of the Philippines. #5 - Villa Ibarra (Cavite, Luzon): This hotel and wedding venue is a love letter to romance itself. From the spiraling staircases, chandeliers, and solitary piano, to its lyrical landscape set on the ridge of the Taal Lake, the boutique hotel exudes passion and intimacy in the best possible ways. #6 - Shangri-La Boracay (Aklan, Visayas): This is the only international five-star resort on Boracay island that provides a verdant natural setting with every modern convenience and luxury. Vows are exchanged at the Pavilion overlooking the sea, the island's most elegant venue for wedding ceremonies. #7 - Camayan Beach Resort (Subic Bay, Luzon): This resort is on the outer part of the bay, surrounded by lush rainforest and a clear aqua-blue reef. It is far enough away from town to provide a peaceful escape and exciting adventure, but still close enough to enjoy Subic town shopping, cinemas and bar hopping if you or wedding guests would like to. #8 - Aquatico Beach Resort (Batangas, Luzon): Bring your dream wedding to life in the fascinating ambience of Acuatico, or celebrate other special moments in a paradise like setting. Their professional events team will take care of every detail, making any occasion an endearing one. #9 - El Nido Resorts (Palawan): This group of eco-resorts, located in the El Nido-Taytay municipalities in northern Palawan, Philippines, offers genuine, local hospitality and unique and enriching experiences amidst the beautiful natural landscape. #10 - Panglao Island Nature Resort and Spa (Bohol, Visayas): This beautiful hotel has amazing beach views, and several options for weddings. They have a landscaped tropical garden, a dream islet, and a verdant pavilion with all-weather functionality in a canopied garden setting.